Oh Ma Gad! I have missed the internets so much!!! I’ve been able to lurk a bit on my iphone but I haven’t been able to post anything to facebook for some reason and the blogger ap I have on my iphone has only worked intermittently and the photo upload on it suuuuuucks! My computer needed major therapy though and I was very lucky that my family pictures have survived because I almost didn’t get to rescue them and didn’t have a back up. My computer is now restored to factory settings and I have lost everything but my pictures. 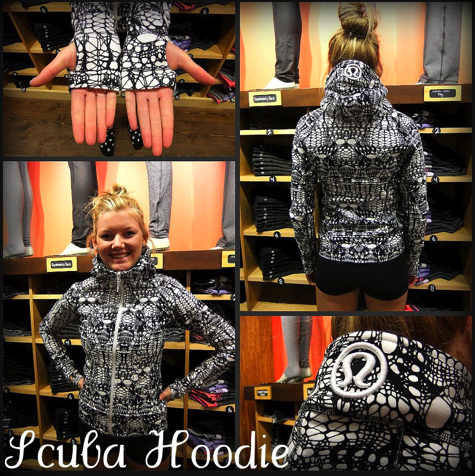 Anywhooo, were back and as I look thru all the lululemon photos on facebook I’m a bit overwhelmed and not sure where to start. I think it’ll take me a few posts to get back into the groove of what is new, what you’ve already probably seen 1000 times and what is the hottest thing out right now. For now, there is this. 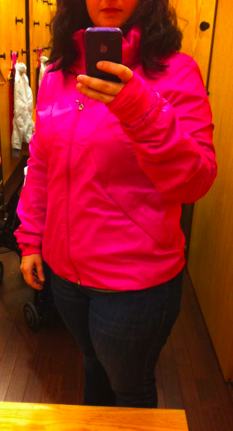 The Paris Pink Hustle jacket is amazing!! 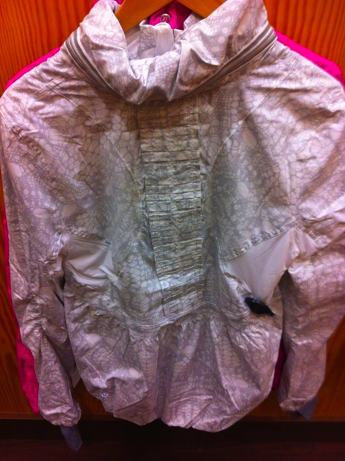 I own two Hustle Jackets from last year and they are the best designed running jacket by far. 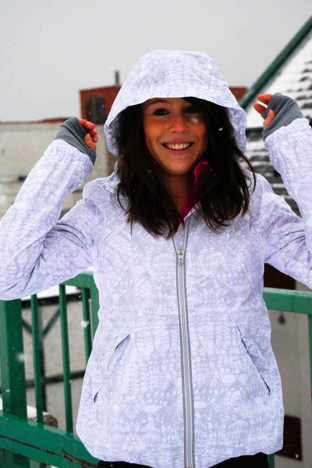 You may or may not like the styling of ruffles and bustles but as far as functionality this jacket is an awesome value (compared to other lulu jackets of course, not other brands). The fit is on the more relaxed side so the ones I own are size 8 and comfortably fit a thin long sleeve running top underneath but wouldn’t fit a bulky sweatshirt. I’d say it runs a half size large but not a full size. The one I have here is a 10. I love that the fabric is soft swift and really flexible, much prefer that to Glyde. 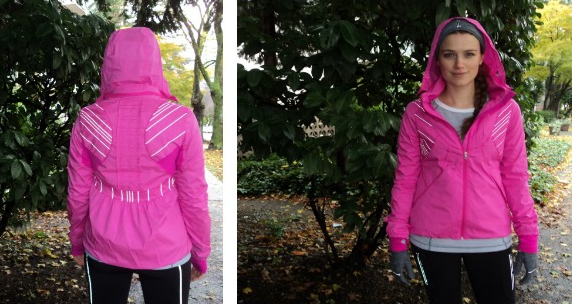 There is a hidden hood in the collar, perfectly designed reflectivity and running luon cuffs and an easy glide zipper. 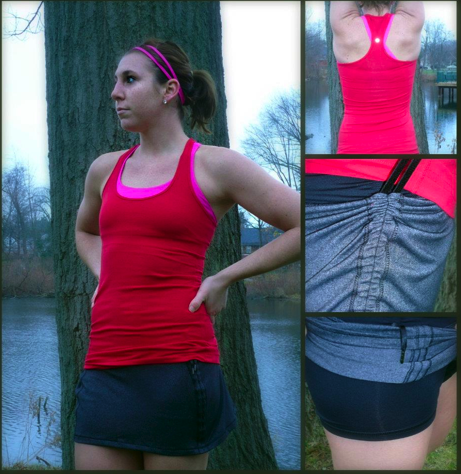 If you don’t already own a lululemon running jacket I highly recommend this one. It saw me thru half marathon training all winter last year and was my go too outfit for pouring torrential rains and kept me warm, dry and really comfortable. If I didn’t already have two from last year I’d be all over this Paris Pink one but I love the colors I already have so don’t see myself selling them in favor of this color. 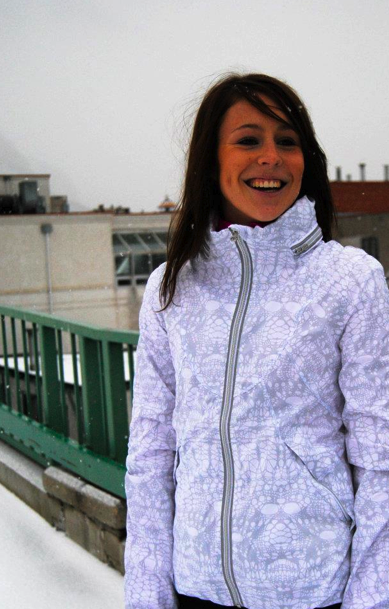 This one is white with silver glacier print on it. Glacier Print Scuba. Looks exactly like last years scribble birds nest print….wait, that was from earlier this year. Came home with this one today. Wasn’t planning on adding to my CRB’s but I tried the red on and it was a gorgeous cherry red. Need to sell something to keep this one. Persian Purple Omber Stripe Lively Crewneck Tee. I was told by a birdie at my store today that there may be Cabin LS’s in this print. Maybe but she wouldn’t officially say. So that is what I’m saving my pennies for because I’ve been living in my Cabin LS and it’s gotten to the point that I’m wearing it two days, washing one day, wearing again for two days. Sad! I got this new shopper today and a little white matching coin purse (gift card coin purse) and they are so cute! Much prefer this to the stupid Who is John Galt? shopping bags. I wonder if these white shoppers were planned at the same time as the JG ones or if these are in response to all of the negative press in the Globe and Mail about the John Galt bags and how blatantly arrogant it is for a corporation to use this slogan. 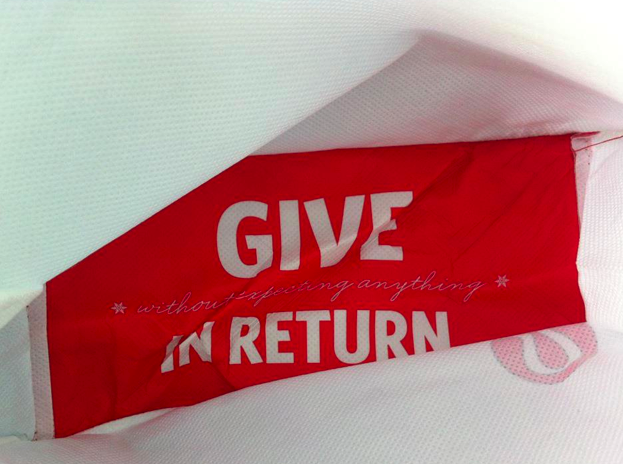 A much nicer message on these bags I’d say. Quite the opposite from the Jon Galt Message. 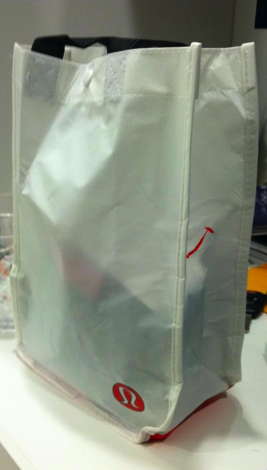 "Lululemon Switches to Biodegradable FedEx Packaging"